Late last week Microsoft warned of game performance and mouse responsiveness issues resulting from a recent update - Windows 10 update KB4482887. The irony was that KB4482887 was trumpeted as a 'quality improvement' update, with the fanfare announcing the arrival of retpoline to Windows 10 – reducing the significant slowdowns seen in some PCs inflicted by the Spectre and Meltdown related security patches. In brief, update KB4482887 could result in "about 25% speedup in Office app launch times and up to 1.5-2x improved throughput in the Diskspd (storage) and NTttcp (networking) benchmarks on Broadwell CPUs". However on Friday we learned that those that had updated "may notice graphics and mouse performance degradation with desktop gaming when playing certain games, such as Destiny 2." Oops. Microsoft suggested a 'short term' fix of uninstalling KB4482887 "to regain performance". And it has been good to its word, it initially appears. A few hours ago Windows 10 update KB4489899 for Windows 10 version 1809 was released. The important part of KB4489899, in light of the above, and for PC gamers, is that it "Addresses an issue that may degrade graphics and mouse performance with desktop gaming when playing certain games, such as Destiny 2, after installing KB4482887". There are no new features in this update but there are some further quality improvements in addition to the gaming fix. 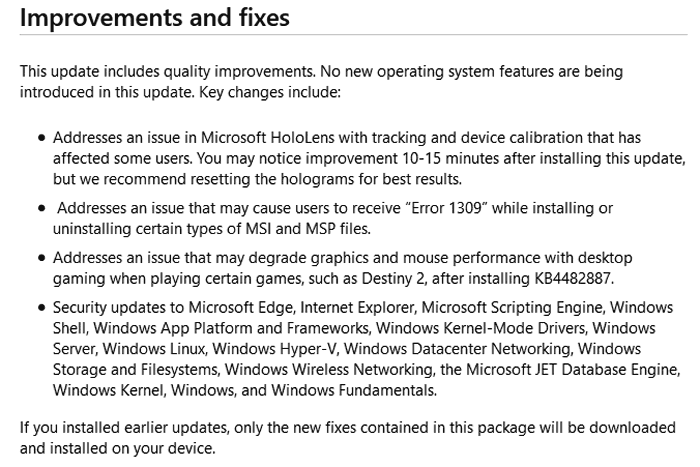 Microsoft highlights that KB4489899 has updates for HoloLens, to improve reliability when using the AR device. More specifically it addresses tracking and device calibration problems noticed by some users. If you head on over to the update release notes you will find that Microsoft has stuffed KB4489899 with lots of security fixes too – these are coming to Edge, IE, and many components central to Windows too. Last but not least, a couple of known issues come along with KB4489899 – an IE11 authentication issue, and functional issues on machines with multiple audio devices. This latest update will be available automatically or you can head on over to the Microsoft Update Catalogue to get the standalone package. Cinebench 20 score went from 1045 to 1191 with this patch in place.